Spring is slowly creeping in here in the Bay Area. As my fruit trees begin to fill with tiny blossoms and daffodils push through the ground, it’s clear that nature is moving forward into a new season. There is no holding back this progression. 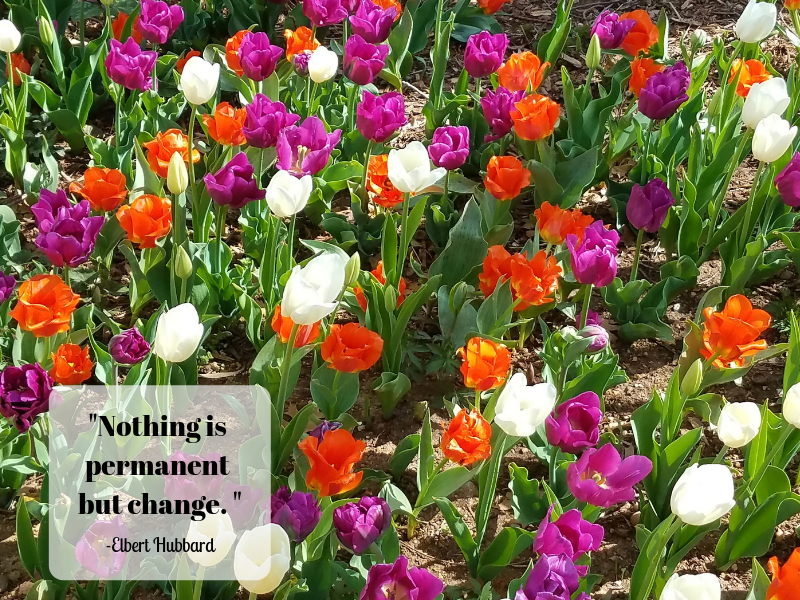 Deciduous plants can’t choose to stay in their dormant stage, whether they want to or not. The Earth calls them to fill with small green buds of hope, preparing to explode with new growth and beauty. Spring bulbs magically push through the ground with even the slightest warming of the soil. Weeds begin filling in every open space they can find, multiplying at an overwhelming rate. Though the change of seasons is pretty tame here in our mild climate, it still provides a comforting routine and predictability. Weeks of rain in the winter can become a bit monotonous, but we expect them and even give thanks for them, knowing the promise of spring sunshine is only weeks away. In the fall, we get just enough shades of scarlet and gold on the trees to feel the end of another calendar year approaching. I look forward to the warm days and cool nights of our summer season all year long. Although we pretend we have control over the ebb and flow of our lives, they follow certain inevitable cycles, as well. We generally expect the predictable stages, such as growing up, school, marriage, raising children, and retirement. But within those eras, there are seasons. Times when a job might be very fulfilling and another period where the stress it brings is draining. Periods when family responsibilities take up every ounce of your energy and attention and others when some moments belong to you, and maybe even leave you enough time to resume your favorite hobby or pick up a new one. There are years when every penny counts and others where you find yourself comfortable and looking for opportunities to share your good fortune. One year, on a landmark birthday, a favorite relative of mine told me that there were many seasons to life. Some pieces will fit into some seasons, and some into others, but they are always a part of you, even when you have to set them aside for awhile. As someone who has a long list of creative passions, this has been a comfort to me as I get older. After years of trying to cram all of my interests into every year of my life, I can now more comfortably put one on hold when I need some breathing room, knowing that it is still a part of me that I can choose to reclaim when the time is right. For me, the real trick is to identify and respond when a season is shifting. Without the signal of leaves turning crimson, or bulbs pushing through the ground, it can be hard to tell when my life is shifting from one phase to another. Too often, I stubbornly insist on dragging along a piece from one stage into the next. It doesn’t seem so ridiculous at the time, but eventually it becomes abundantly clear that it is time to let it go and wait for it to come around again. It can be so hard to accept these shifts, but I try to remember how silly it would look for my apple tree to sprout blossoms in November or for the Japanese Maple to turn its brilliant red in June. Everything belongs in its time and place. We simply have to be present enough to enjoy the change, or when the time is right, to let it go to know that it may come back around again. Julie Haydon is an artist and musician living in the beautiful hills of Oakland, CA who creates works of beauty that brings people together. When she is not at work in the studio or making music, she is outside playing in the dirt or hiking with her husband and their two spoiled dogs.